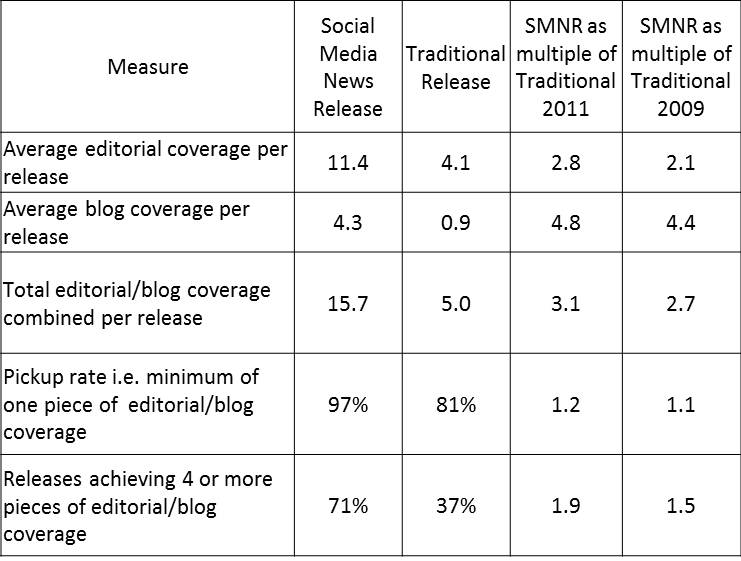 In the summer of 2009 we did some analysis looking at whether Social Media News Releases (SMNR) achieved more coverage than “traditional” press releases. The analysis of almost one thousand releases showed that SMNRs distributed byÂ RealWire generated twice the editorial coverage and almost four times the blog coverage. So overall the sample of SMNRs achieved over three times as much editorial/blog coverage on average (15.7 pieces v 5.0 pieces) as the “traditional” releases. Some examples from different sectors of high performing SMNRs include releases by Panasonic, Alterian, 3M, Warner Bros, Rolls Royce and Aviva. As with the previous analysis I think one of the primary reasons for the difference in performance is that the additional investment that can often be required to produce an SMNR – multimedia assets, links to background research etc – means that they are used for stories that the sender perceives are potentially high impact and therefore likely to be of interest to a wide audience. Another reason could be the lower proportion of B2B releases in the SMNR sample. However I am not necessarily convinced this is the case as there are plenty of examples of B2B releases in the traditional sample that performed to a similar level as the best performing B2C SMNRs. As I indicated in my interview with Shel I think it is more likely that a higher proportion of traditional releases are more informative in nature e.g. new appointment, new customer, financial results, tradeshow attendance etc. These stories are of potential value to relevant publications, but it is likely that the number of such publications will be lower than where the release is around a broader topic of conversation e.g. research, market changes, new products etc. If people would find this of interest then let me know in the comments as further study of the nature of the releases themselves might shed some more light. I was reviewing the stats relating to my last post about the performance of Social Media Releases earlier today. Apart from being very pleasantly surprised to have nearly reached 1000 unique views (making this easily my most visited post to date!) I also found that the number one source of traffic was “direct”. This means traffic that has been referred to the urls directly and not from another online source. Now unless anyone is able to remember a url with 141 characters, which I am guessing is unlikely, then I assume all of these visits must have come from people visiting the post from emails that include a hyperlink. Twitter also counts for almost a third of the visits, which isn’t surprising given that the post has been tweeted 128 times to date (thank you to everyone who RT’d). 3i, Adobe, British Army, Cisco, Comic Relief, Cross Country Trains, Diageo, Durex, First Direct, Ford, HSBC, ITV, Macmillan Cancer Support, Nescafe, NSPCC, Peugeot, Sage, Skoda, Sony Ericsson, Symantec, Talk Talk, Toshiba, Twestival, Vauxhall and Volkswagen. Some are in a narrative style, some follow the original deconstructed format. So it is on this basis we feel fairly well qualified to provide some analysis on whether Social Media News Releases actually achieve better results than “traditional” press releases. We analysed 997 releases distributed by RealWire during the period December 2008 to May 2009 for which coverage tracking statistics had been gathered by our Proveit release evaluation service. Of these 71 releases were Social Media News Releases. Total coverage includes coverage that is the republishing of the release in its entirety either by selective or non selective publishers. It is worth noting that all of these results for both SMNRs and traditional releases compare favourably with analysis of competing distribution services suggesting that the combination of our clients, their releases and RealWire’s approach performs strongly for all types of release. However the results above suggest that Social Media News Releases perform substantially better than traditional releases when it comes to generating editorial and blog coverage with, on average,Â all of the additional coverage being of this type. So a big tick in the box for SMNRs then? All we have to do is produce all releases in this format and we will all achieve two or three times as much coverage? Well not so fast. A simple regression analysis on the data suggests that a release just being an SMNR, as opposed to a traditional release, in itself only explains a small proportion of the variation in the performance of individual releases. So the majority of the variation would seem to be due to other factors. There are any number of factors that could explain some degree of variation – the hook of the title, timing, number of interested parties etc. Significantly more detailed work would be needed to prove the impact of each. But I would suggest that the most likely reason for the improvement in performance of SMNRs is that the additional investment needed to produce a SMNR means that clients are more likely to use them for the most interesting stories. It is this investment in quality that then pays dividends with the features of the SMNR allowing the user to enhance that storytelling and so produce the improved results. Less stories. More creatively told. To the right people. The first point may seem like a strange thing for a press release distribution company to say – “less stories”, doesn’t that mean less business? As I said earlier, the results of our own distribution actually indicate that releases we distribute for our clients are already of a relatively higher quality and/or are directed to more relevant people and hence our pickup stats compare very favourably to competing services. However the analysis implies that the discipline of investing more in the telling of a story through a Social Media Release seems to lead senders to focus on the stories that generate the most interest editorially and from bloggers. Surely that is a good thing for all parties? When 54% of press releases from the big wires apparently never get written about, wouldn’t focussing more on the half that are of interest be a better use of the PR industry’s resources?